Lionfish and Scorpionfish are members of the Scorpaenidae family, with over 22 genera and hundreds of species, this is a large family. Members of the Scorpaenidae family tend to eat just about anything that can fit in their mouth, so they are best suited to fish only tanks with other large predatory fish. The Volitans Lionfish (Pterois volitans) is one of the most commonly sold Scorpionfish in the aquarium hobby. Other frequently seen species include the Dwarf Lionfish (Dendrochirus zebra), Leaf Fish (Taenianotus triacanthus) and Orangebanded Stingfish (Choridactylus multibarbus). Lionfish are native to the Pacific and Indian Oceans; however, they have been released into the Atlantic Ocean where they are considered an invasive species. Many lionfish and Scorpionfish are ambush predators, preferring to wait for a hapless fish or shrimp to stray to near, however some species are known to actively hunt and corner prey. The bright red and white bands characteristic of the lionfish, is known as warning coloration and used to let would be predators know that they pack a powerful sting. Lionfish and Scorpionfish can be great marine aquarium inhabitants. They tend to become very tame, often learn to beg for food from their keeper. Extreme care must be taken when working around, or handling lionfish. They have a venomous sting that can cause excruciating pain and in some rare cases, medical emergencies. Many species of lionfish and Scorpionfish do not require a very large tank. 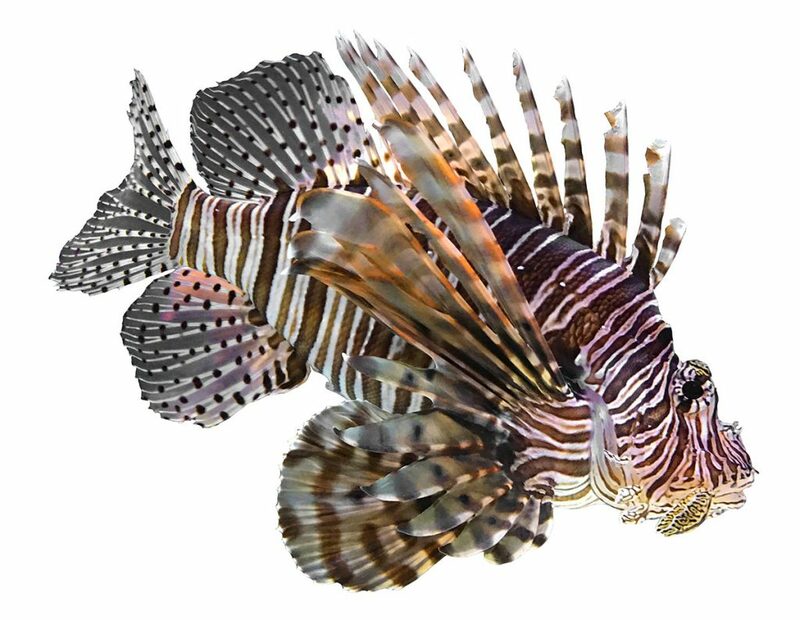 However, it is important to consider carefully what species of lionfish may be best for your aquarium. While smaller species such as the Dwarf Lionfish (Dendrochirus zebra) are suited to tanks as small as forty gallons, larger species such as the Volitans Lionfish (Pterois volitans) may be better suited to a much larger tank. We suggest a diet based on Piscine Energetics Frozen Mysis, Piscine Energetics Pellets (1mm, 2mm and 3mm) and Piscine Energetics Saltwater Flakes.